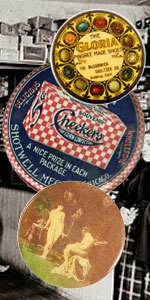 Collectors love Pocket Mirrors for their imagery, art, colors, and nostalgia. 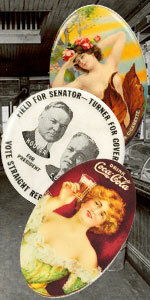 These objects were mainly used for advertising purposes before there were TVs or commercials constantly surrounding us. Stores or Companies would give away Pocket Mirrors as gifts or promotions, people carried around the mirrors in their purses or pockets, and then whenever they used the mirror they would be reminded of that store or product (as would the people around them who saw it). Collecting Pocket Mirrors has become a busy hobby with many people avidly searching for that rare gem to add to their collection. While most Pocket Mirrors can be had for less than $50, some of the rarest and most beautiful can be well over $1000! That means that whether you’re just getting started or have been collecting for a long time, there are always items available at your price range, and hopefully this site can help guide you in your search. We will offer to buy single pocket mirrors or entire collections of pocket advertising items. If you found a mirror like yours in our image gallery and it’s in fair to good condition, it’s very likely that it’s valuable and we will probably make you an offer for it. We make aggressive offers for rare or high-grade mirrors and we do several deals every month, usually beating out offers from other dealers and collectors. If you would like an offer for your pocket mirror or advertising item then you can text pictures of your item to 404-606-2648 or email to Dale@CelluloidMirrors.com. Getting us pictures means that we can help you more quickly and more accurately. As a service to collectors, experts, and novices alike, we offer free appraisals for pocket mirrors and advertising items. 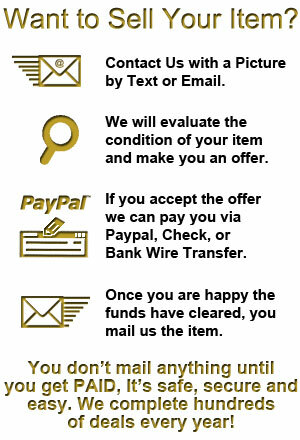 Whether you’ve just inherited something and need to know what it’s worth, you found something you’re interested in and don’t know what to pay, or you are just curious for information about your item, feel free to contact us with pictures and we can help you by providing an estimated value based on rarity, condition, and current market trends.